On Tuesday, we published our first Philadelphia Eagles-only mock draft of the offseason. Today we'll take a peek around at some of the national guys and see who they have going to the Birds at 32nd overall. Some of the below mock drafts are old, some are new. For fans of a team that just won a Super Bowl, however, they're probably all new. The Eagles love explosive defenders who play with an edge. Evans fits that profile. #JimmySays: I agree with the rationale, and LB is a need, but I wonder how much the team values the linebacker position. Evans is a rugged ILB perfectly suited to play as a "plugger" behind a talented front line. #JimmySays: And we have an early favorite, it seems. Philly has worked to improve the CB position, but the Eagles still need help there. #JimmySays: The Eagles are loaded with young corners. Ronald Darby is 24. Jalen Mills is 23. Rasul Douglas is 22. Sidney Jones is 21. If there's a position where the Eagles have room to grow with the players already on the roster, it's at corner. If a corner is sitting there at 32 that has no earthly business falling that far, then sure, take him. But it's not a need anymore. Hernandez showed what he was capable of at the Senior Bowl and would be another powerful run blocker to help maintain a diverse offensive scheme. #JimmySays: Eh. If I'm drafting a guard in the first round, I want him starting, and that's not happening on the Eagles' line anytime soon. Jason Peters, a stalwart at left tackle for the Eagles, turns 36 this month and is recovering from a torn ACL and MCL. Can they really expect him back at his best? I don't think fifth-round pick Halapoulivaati Vaitai is the answer as his replacement, either, which means Philadelphia could move super athletic right tackle Lane Johnson to Carson Wentz's blind side, and draft a new right tackle. Miller is a developmental prospect with a 6-8 frame and limited game time. He has a high ceiling. #JimmySays: To note, this was before the Eagles' walloping of the Vikings in the NFC Championship Game, so Kiper had not yet seen Vaitai negate Everson Griffen. Still, I'm fine with this pick. After winning a Super Bowl with a backup QB, it's fair to say this is a deep roster. The Eagles have the luxury of drafting for value, and it's never a bad idea to add depth along the defensive line. A twitchy one-gap DT with the tools to continue to develop, Bryan is raw, but he has the athleticism to mold and good get-off quickness. He could work into Philadelphia's defensive line rotation behind Fletcher Cox and Timmy Jernigan. #JimmySays: In my first Eagles only mock draft, I had the Birds taking penetrating Michigan DT Maurice Hurst. I like the selection of Bryan for similar reasons as McShay notes above. The Eagles have made a point of drafting depth at the defensive line, so it would hardly be surprising if they decided to invest more assets in the position, especially with Chris Long not secured for the long haul. #JimmySays: Yep. Nothing wrong with continuing to load up on pass rushers. They win championships. It is difficult to find a real need on the Eagles. Linebacker is one spot, due to potential free agents and injuries in 2018. But with LeGarrette Blount a free agent, Jay Ajayi nearing the end of his rookie deal and a tight cap, why not add a great running back talent like Guice? 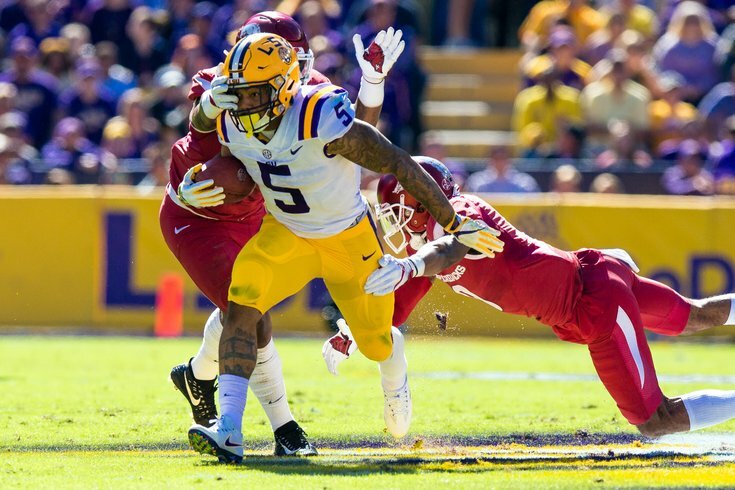 #JimmySays: If Guice is still there at 32, the Eagles should be thrilled. Crosby is a glider when getting to the second level and plays with a low, balanced base. He's the type of offensive linemen the Eagles would likely have higher on their board than other teams due to what they ask of their blockers. #JimmySays: Duck bias! I do like Crosby, and think he's first round-worthy. Okorafor should see his stock rise once he gets in a setting like the combine where his athleticism can be judged side-by-side with other top tackle prospects. It's easy to imagine a team falling in love with his projection and taking him higher than this, but if he's available, he'd be a great option to pair with Lane Johnson long-term at the tackle spot for the Eagles. #JimmySays: Okorafor is 6'6, 330, and light on his feet. He can move bodies in the run game, and he anchors well in pass protection. He also has experience both at RT and LT, which will interest the Eagles. On the downside, there are concerns about his hand fighting and his overall technique, though that can be improved with NFL coaching. He'd make sense as a guy who can be groomed behind Peters. #JimmySays: I like Andrews quite a bit as a downfield threat who averaged over 15 yards per catch for his career. However, the first round is a major investment in a position where Andrews will never start as long as Zach Ertz is around.